Forgot your password? • Sign up! Home delivery in Europe within 7 days! Paprika powder is made from the fully ripe, dried and milled fruit of the Capsicum annuum L. Var. Longum paprika varieties which may be sweet or hot. The condiment paprika is a variant of Capsicum. The name of Capsicum more likely is coming from the Greek Kapto, which means 'to bite' referring to the pungency of heat of the fruit. The word paprika originates from the Greek or Latin peperi-piper that means pepper however the word has a Sanskrit origin (Balint 1962). For quite a long while in Europe there was confusion regarding the differentiation between pepper and paprika. Many European languages use a similar word whilst examples from other languages include the Hebrew paprika [פפריקה] and the Japanese papurika [パプリカ]. One folk etymology that is contradicted by linguist evidence is that paprika was named after the religious Hindu figure Rysh Paprike. At the beginning the plant was a decoration in the Baroque gardens of the European aristocratic castles. As a result of trade relations it reached Turkey. The capsicum plant, strong as pepper­, was brought to our country by the Turkish janissary. In the second half of the 16th century an aristocratic lady, Margit Széchy, a relative of the Hungarian royal family, decorated her garden with a plant called "red Turkish pepper­"(vörös török­bors). At that time the plant was named after its presumed origins, it was also called "Indian pepper­" (indiai bors) or "pagan pepper­" (pogánybors). The plant that makes the Hungarian version of the spice was grown from 1529 by the Turks at Buda (now part of the capital of Hungary, Budapest). Shepherds and herdsmen who had more contact with the invaders started spice their meals with the fiery powder first. The first recorded use of the word "paprika" in English is from 1896. It came from the Hungarianword "paprika", which was a diminutive of the Croatianand Serbianword "papar" (meaning "pepper") which in turn came from the Latin "piper" or Modern Greek "piperi". Similar words, "peperke", "piperke", and "paparka", are used in various other Slavic languages in the Balkans for bell peppers. By the 19th century paprika became a dominant spice in Hungarian kitchens and restaurants. 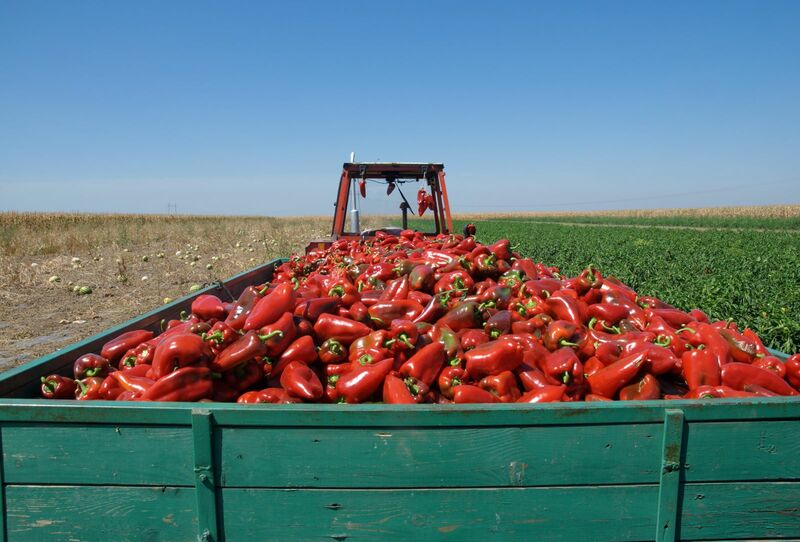 Due to the favourable climate and geographical conditions Hungarian paprika has a bright red colour and a distinctive rich flavour that allowed Hungary to became one of the leading paprika producers in the world...Kalocsa and Szeged in the southern part of Hungary are the heart of paprika production in Hungary. These regions have the highest amount of sunny hours a year and paprika plants need lots of sunshine to get ripe and sweet. • Special quality (Különleges) the mildest, very sweet with a deep bright red color. 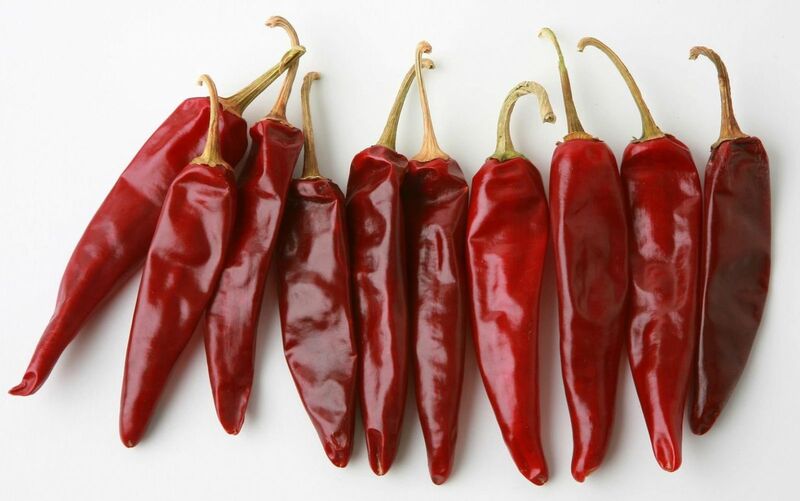 • Delicate (csípősmentes csemege) – color from light to dark red, a mild paprika with a rich flavor. • Exquisite Delicate (Csemegepaprika) – similar to Delicate, but more pungent. • Pungent Exquisite Delicate (Csípős Csemege, Pikáns) – an even more pungent version of Delicate. • Rose (Rózsa) – pale red in color with strong aroma and mild pungency. • Noble Sweet (Édesnemes) – the most commonly exported paprika; bright red and slightly pungent. • Half-Sweet (Félédes) – A blend of mild and pungent paprikas; medium pungency. • Strong (Erős) – light brown in color, the spiciest paprika. 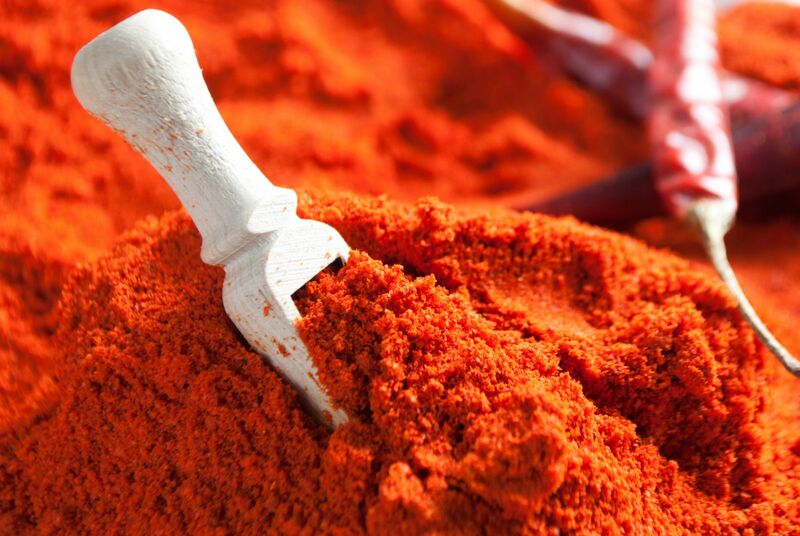 Why is paprika going to be the spice of the future? The man of our days needs vitamins and antioxidant substances in an increasing degree. We use paprika mainly as a spice, athough the vitamins and antioxidant substances of the capsicum all serve the protection of our organism. The Nobel Prize of Albert SzentGyörgyi, vitamin C and capsicum are strongly connected notions, all being worldwide famous. But the carotinoids assuring the colour, the provitamins, the capsaicin, the tocoferols of the seeds are all 21st -century substances. These all have been used as medicine for a long time and they still serve as raw materials for medical specifics. In the future we can onward consume the paprika of Szeged as a spice that preserves health. The market for high quality condiment paprika for the spice and cosmetic industry is rapidly increasing. Capsaicin and oleoresin extracted from condiment paprika for pharmacology and the cosmetic industry must also be considered. Due to the restricted use of artificial colouring agents allowed in cosmetics and canning industries, demand for the resin is increasing rapidly. Demand for the milled paprika product has grown by 42% in the last five years. We estimate the current growth is 20% per annum. The recent increased need for natural spices and colorants expanded the demand for high quality condiment paprika worldwide and historically Hungary produce the high quality condiment paprika required. If we consider the Australian, European, North American, Japanese and South East Asian consumption then we can conservatively estimate the markets at 19,000 t y-1 which is a potential market of $55 million. Ferenc Horváth and Jenő Obermayer form Kalocsa developed the first non-pungent pepper variety in the world through cross-breeding. This pepper type is sweet and there's no need to remove the veins and seeds. The fresh red pepper is rich in vitamin C (150mg/100g paprika) and other important minerals. Albert Szent-Györgyi, Hungarian scientist was awarded the Noble prize in 1937 for discovering vitamin C, its antiscorbutic and other physiological effects. Native Americans used chili for various purposes: as tear gas, as treatment for sores, or to punish children. Flamingoes will have brighter feather colour is paprika is added to their food. Would you think that even pálinka (brandy) is made from paprika? Hungaricums are those noteworthy values of Hungary, which characterize the Hungarians by their uniqueness, specialty and quality, and are the peak performance of the Hungarians. In our collection, funny videos and tutorials as well we would like to kindly towards our visitors. We hope you can find you like, which you have fun!